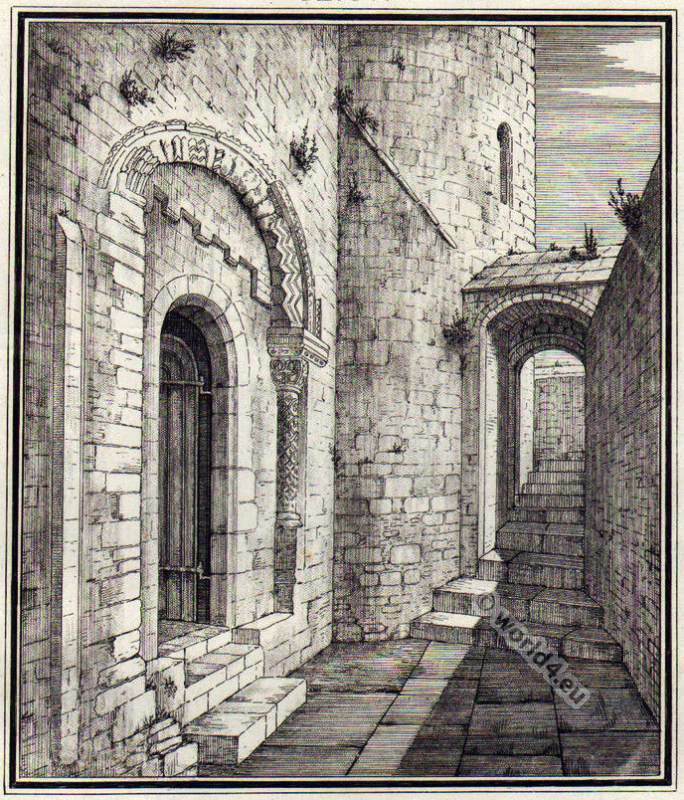 Home » Roger Mortimer, 1. Earl of March. The seizure of Roger de Mortimer in Nottingham Castle October 19th 1330. Roger Mortimer, 1. Earl of March, 1287-1330. The name of this man is inscribed on one of the darkest pages of English history, and though it is associated with the great house of Lancaster, which afterwards long maintained its power over the English throne, it can only be regarded as equalling in infamy that of the wicked and ignoble king whose neglected queen chose the great noble for her paramour. 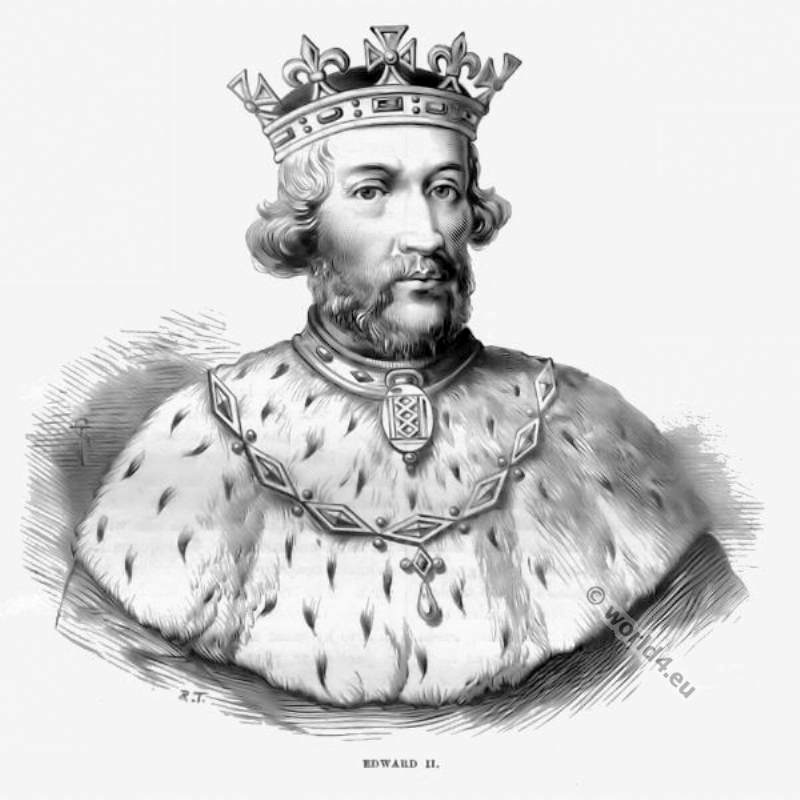 The weak tool of base favourites and the companion of sots and buffoons, Edward II. appears to have been afflicted with a moral imbecility which prevented him from being true either to himself or to others, except in the two instances of Piers Gaveston and Hugh Despenser, to whom he showed in succession an almost idiotic and fawning complacency, which aroused the wrath of the nobles whom they superseded and the nation whom they wronged. For Gaveston, whose presence in England Edward I. had forbidden just before his death, the king neglected wife, and throne, and state, subversed his councils, and betrayed his friends. The war which his father had carried on against Scotland and had left to him to continue sank into a mere pretence of hostilities, till the barons demanded annual parliaments and decreed that all grants made to Gaveston should be recalled. Edward was compelled to yield, and when Gaveston retired to Flanders, prepared to go to York after the dissolution of the assembly, for the great Robert the Bruce was already beginning to achieve the entire deliverance and independence of Scotland. 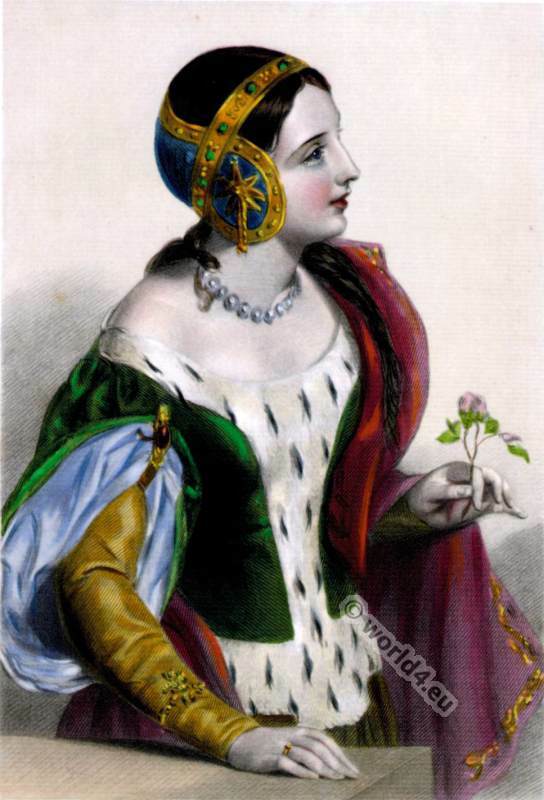 The queen, the lovely Isabella of France, was left behind with the utmost indifference, and in a few weeks Gaveston was back again with the king, who restored all his estates and honours. His time had come, however. The Earl of Lancaster, cousin to Edward, headed the barons who came upon the royal party at Newcastle, whence the king escaped; while Gaveston retreated to Scarborough Castle, was besieged there, and, after capitulating, was conveyed to Dedington, where the grim Earl of Warwick met him and carried him to Warwick Castle. There he was tried by a hasty council consisting of the Earls of Lancaster, Hereford, and Arundel, who, with other chiefs, condemned him to death, a sentence which was at once executed on Blacklow Hill, a rising knoll overlooking the Avon, where he was beheaded. Then followed that series of achievements by which Robert the Bruce and his patriotic followers maintained the independence of Scotland—ending with the battle of Bannockburn, where the great English army was overthrown by a force much fewer in number and with vastly inferior equipments. Not till the Scottish forces had by a series of incursions carried their arms into Yorkshire, was a truce concluded which was to last for two years, after which there was to be a suspension of arms for thirteen years, unaffected by the death of either or both of the contracting parties. But in those two years Edward had contrived to ruin his own claim to hold the throne, by alienating from him both the barons and the people. Another favourite (Hugh Despenser) had taken the place of Gaveston, and with the same result. Sentence of banishment was pronounced against the whole family of the Despensers in August, 1321; in October they had returned, encouraged by the sudden action of the king, who had caused twelve knights of the opposite party to be hanged—and by the sudden departure to the north of the Earl of Lancaster, who as a prince of the blood was their most powerful enemy. For a time it appeared as though Edward would regain his position and be able to maintain that of his favourites, for Lancaster had agreed with the Scots that an army should be sent across the border to join his own forces. This aroused the wrath of the English people, who thenceforward looked upon him as a traitor, and he was finally compelled to surrender with a number of other knights after an engagement in which several of his companions were killed. In his own castle of Pontefract a court was formed of six earls and a number of barons of the king’s party. Lancaster was tried and found guilty of treason, and amidst insult and indignities was led to execution along with twenty-nine of his followers, consisting of knights and baronets, while many were thrown into prison. Others escaped to France, where they soon began to plan the ruin of the king and his adherents. The latter had already provoked the hatred of the nation by their arrogance, while Edward himself had disgusted the people by his vices, and had aroused indignation by the suspension of hostilities with Scotland, although that measure may be considered as the most politic he could have adopted under the constant reverses which he had experienced in the endeavour to repulse Bruce and his advancing army. After the treaty was concluded an attempt was made first to remove the elder Despenser, and next to liberate some of the Lancastrian prisoners. It failed, except in one important instance. Roger de Mortimer, who had been twice condemned for treason, and was then lying in the Tower of London under sentence of death, contrived to drug his keepers and to escape by means of a ladder of ropes, after which he succeeded in reaching the Hampshire coast, and crossing to France, where he joined the malcontents. The plan against the king was not yet complete. It needed the presence of the Queen Isabella and of the young Prince Edward, her son, to make it secure. 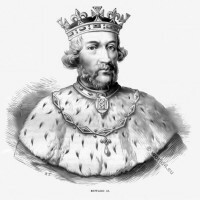 Charles le Bel, Isabella’s brother, had long had a dispute with Edward III. on the subject of sundry English possessions, which he (Charles) had seized on the Continent, and the queen represented to her husband that she could obtain from him acknowledgments of more importance than he would yield to ambassadors. Edward agreed that she should proceed to Paris; and in March, 1325, she set out with a splendid retinue for Boulogne. The treaty which she made demanded the presence of Edward himself to do homage for the territory he was allowed to retain in France, a proposition the dishonour of which he appears not to have resented, since he prepared to make the voyage and reached Dover, whence he sent word that sickness prevented him from concluding his journey. It has been supposed that the Despensers—who did not dare to accompany him to Paris, where their enemies were so powerful, and who almost equally dreaded being left alone in England—persuaded him to remain. An answer was returned that if he would concede Ponthieu and Guierre to his son the boy might be allowed to represent him, and to this he acceded, so that the whole party of his enemies were united in France, with Roger de Mortimer as the representative of the house of Lancaster, and the queen at their head. Between Isabella, who was still beautiful and no more than twenty eight years of age, and de Mortimer, who was one of the handsomest and most accomplished men of his time, there arose a guilty companionship, which for a time seemed likely to frustrate the plot against Edward; for Hugh Despenser bribed the French ministers to prevent the formation of an army in the cause of Isabella, and at the same time induced his master to write to the pope, asking him to compel Charles to restore Isabella to England, a request which the pontiff granted by threatening to excommunicate Charles unless he sent his sister to her husband. In feigned anger Charles urged the queen to return, or at all events to leave his kingdom; and she, with the Lancastrians, took refuge with his vassal, the Count of Hainault, to whose daughter the Prince of Wales was soon afterwards affianced. A strong party was formed, which was joined by the ambassadors whom Edward had sent to France, so that an army of 2000 men was ready, headed by Roger de Mortimer, and including not only the exiles of high rank and station—who were so numerous that scarcely one of the whole force was below the rank of knight—but the Earl of Kent (brother to the king), the Earl of Richmond, Lord Beaumont, and the Bishop of Norwich, the ambassador who had joined the queen in the Low Countries. There were at the same time numerous partisans in England, under the leadership of Bishop Orleton, ready to pronounce against the king. When Isabella and her followers landed at Orwell, in Suffolk, she was received with enthusiasm. The force sent to oppose her at once joined her standard and that of the young prince. The Earl of Norfolk, Edward’s other brother, was ready to receive her, the bishops offered their services. 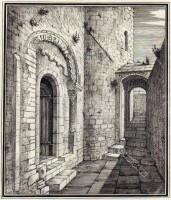 Edward was abandoned alike by nobles and people. The citizens of London refused to aid him against the queen and prince, and he fled with his few retainers, the two Despensers, and the Chancellor Baldock. At Bristol the elder Despenser was taken, tried, and almost immediately executed with horrible torture,and then the barons issued a proclamation summoning Edward to return to the throne. They had no expectation that he would resume his reign, and the next day, assuming the privileges of a parliament, they declared that he had left the country without a ruler, and that the Prince of Wales was the hereditary guardian of the kingdoms. The younger Despenser met with the same dreadful doom as his father, and was hanged at Hereford on a gallows 50 feet high. 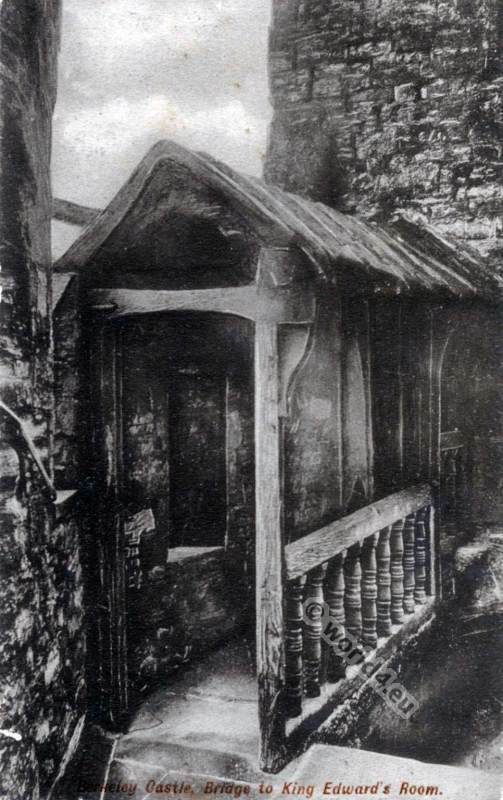 Baldock, as a priest, was spared from the scaffold, but died not long afterwards a prisoner in Newgate. We need not here enter into the terrible tragedy which followed, nor dwell upon the foul murder of the deserted king, whose imprisonment for two months preceded the declaration that he had ceased to reign. That sentence was received by the nation without any voice being raised in his behalf, and the Prince of Wales was proclaimed amidst general acclamation. Five days afterward Stratford, Bishop of Winchester, produced a bill charging Edward of Caernarvon with shameful indolence, incapacity, cowardice, cruelty, and oppression. The young Edward was present in parliament and seated on the throne when the charge was made and the sentence of deposition confirmed. The queen pretended some sorrow. On the 20th of January, 1327, a deputation of bishops, knights, and nobles, representing each county in England, proceeded to Kenilworth, where Edward was confined, to tell him that the people no longer owed him allegiance, and to demand that he should resign the crown. He appeared in the hall wrapped in a common black gown, and at the sight of Bishop Orleton fell to the ground in a swoon. He agreed to every demand, thanked the parliament for not having overlooked his son, and then had to listen to the declaration that he was no longer kings, and to witness the breakings of the White Staff, or wand of office, by the steward of the royal household, Sir Thomas Blount—a ceremony usually performed on the death of the sovereign. He had not long to live. The fearful tragedy which was afterwards enacted was said to have been caused by certain plots which were formed against Mortimer, with the intention of supporting the renewal of the royal claims. 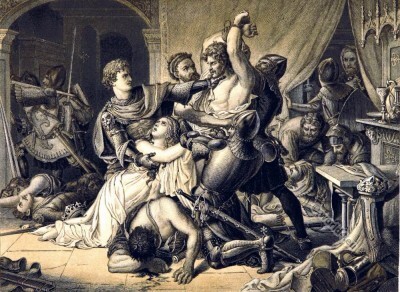 Edward was the prisoner of the Earl of Lancaster, who, though he might have been expected to avenge the death of a brother, treated the deposed king with some courtesy and kindness. 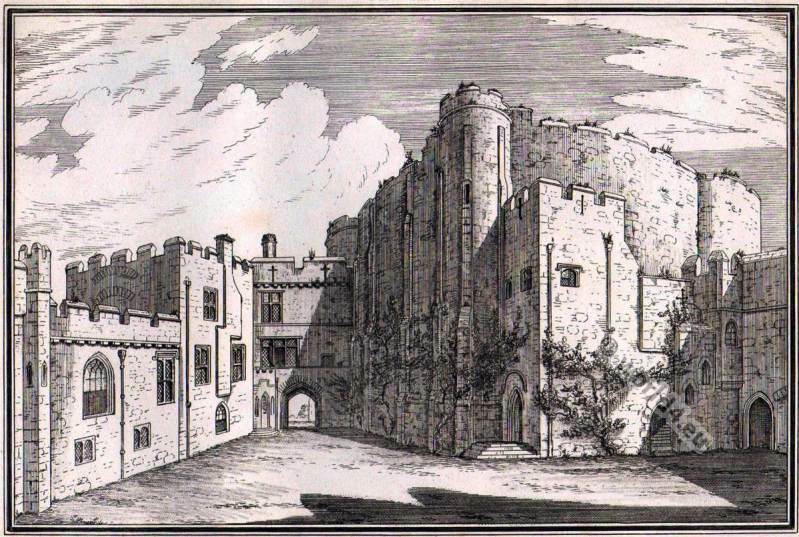 When he was removed from Lancaster’s custody to that of Sir John Maltravers, who had also suffered great wrongs, he was made to travel by night, and, as though with the purpose of concealing his place of confinement, became a prisoner at three or four different castles. 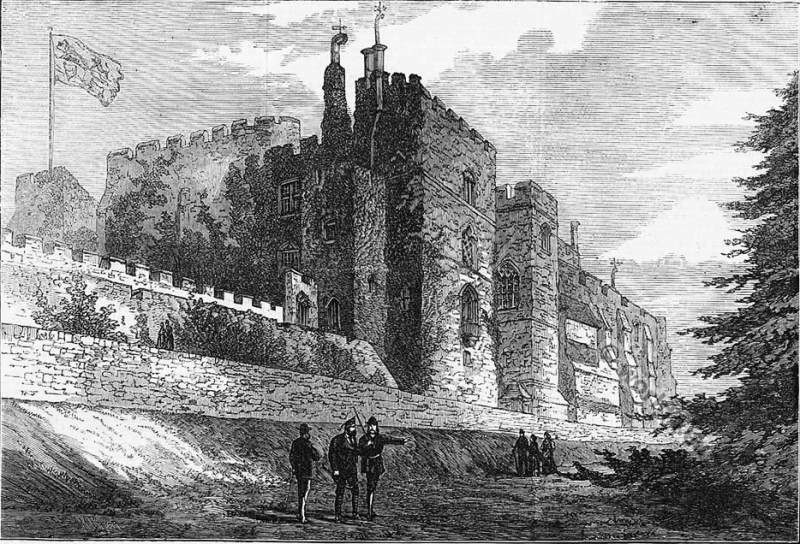 At last he was taken to Berkeley Castle, where Lord Berkeley was associated with Maltravers as his jailer, and proved to be a less fierce and cruel one. But Berkeley fell sick, and during a temporary absence his place was by order of Mortimer filled by Thomas Gourney and William Ogle. Then came that dark September night when shrieks and “a wailful noise” were heard from the castle even by people in the town. The next morning the castle gates were thrown open, and all comers were admitted to see the body of Edward of Caernarvon, who had died in the night “of a sudden disorder.” There were no outward marks of violence, but the countenance was distorted and horrible to look upon. Rumours of foul and secret murder were rife, but few seemed to care for the fate of the wretched king, whose corpse was conveyed to Gloucester and buried in the Abbey Church, the Berkeley family attending the funeral. Inner court of Berkeley Castle from the Gateway. The young Edward was but fourteen, and Queen Isabella, who was herself entirely controlled by Mortimer, became the ruler of the nation. The Earl of Lancaster, who was the guardian of Edward, attempted to oppose the tyrannous usurpation of this bold bad man, who had been loaded with honours, made Earl of March, and was overbearing the council of the regency; but Lancaster stood alone; the prince remained with his mother and the favourite, and the Earls of Kent and Norfolk deserted their kinsman, who, having retreated, left his estates to be plundered by his enemy, and was then obliged to sue for pardon and to pay an enormous fine. 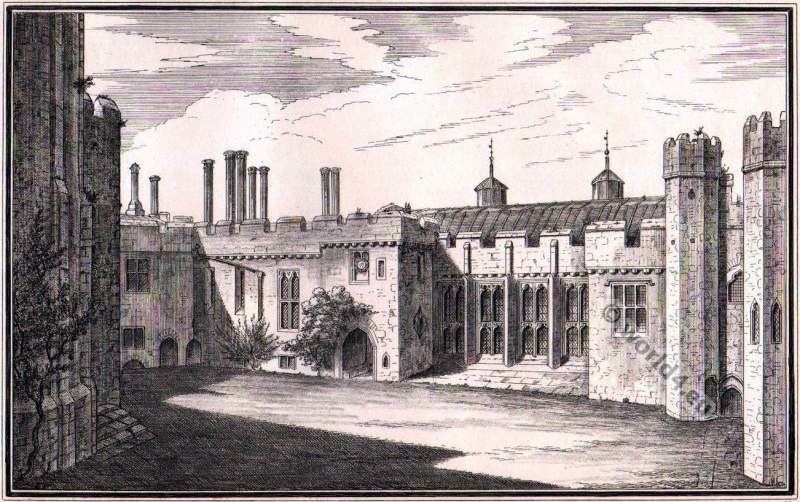 The Earl of Kent was doomed, and by an artful plot Mortimer effected his ruin. Agents were employed to represent to him that his brother (Edward II.) was not dead; that it was the corpse of another which had been taken from Berkeley Castle and buried at Gloucester; that the late king was still a prisoner at Corse Castle. Some monks were found who urged him to release the captive, and restore him to the throne. Forged letters, said to come from the pope, and advising the same course, were brought to him. He was induced to write to his brother, whom he was persuaded was not dead. The letters were conveyed by Maltravers to Isabella and Mortimer, who immediately summoned a parliament to try Kent for high treason. Sentence of death was pronounced, and though it was supposed that his royal blood would protect him he was taken out and beheaded—after the execution had been delayed for some hours till a condemned felon could be found who would consent to do the work of headsman on condition of a free pardon, and because no one could be induced to undertake the office. They sentenced Mortimer to a felon’s death. He was to be drawn and hanged. Edward was present in court as he was at the impeachment of his father; and when Mortimer was sentenced, he desired that the accomplices might be tried also. After a protest that they were not bound to sit in judgment on men of inferior rank, the peers found Sir Simon Bereford, Sir John Maltravers, John Deverel, and Boeges de Bayonne also guilty, and condemned them to death; but three of them had already escaped, and Bereford alone accompanied Mortimer to the scaffold, when he was hanged at “The Elms” in Smithfield, on the 29th of November, his body remaining “two days and two nights to be seen of the people.” The queen-mother, Isabella, was compelled to relinquish her wealth, and passed the remaining twenty-seven years of her life in obscurity in her manor house at Risings. A price was set on the head of Gourney and Ogle, the former of whom was arrested in Spain and handed over to an English officer, who, obeying secret instructions, cut off his head at sea. Sir John Maltravers was executed on the charge of aiding Mortimer in his plot against the Earl of Kent. Lord Berkeley, in whose castle this happened, declared his innocence, demanded a trial, and was acquitted. Thus fell the powerful clique which had ruled England, and the members of which, after having dethroned Edward of Caernarvon and placed the young prince upon the throne, were removed like puppets from the scene. This entry was posted in 1330, 14th Century, England, Genre, Middle Ages and tagged English history, Medieval costume, Pictures and Royal Portraits on 5/9/15 by world4.